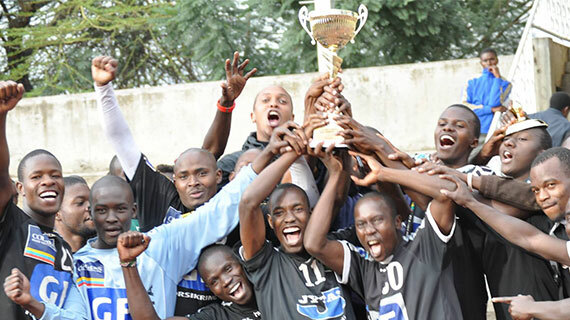 The Technical University of Kenya (TUK) last weekend shocked many by defeating top Kenyan sides Ulinzi and Cereal's to lift the national handball title during the playoffs staged at the Nyayo stadium in Nairobi. TUK beat Cereals 25-22 in an explosive final to win their maiden championship title and Maurice Ochieng the director of Sports at TUK says this was a long journey that was always going to bring home the title. "For the last three years we have been finishing number three and the trophy has been coming, our hard work has finally paid off. Beating Cereals is not an easy task." " We are proud to be looking at the prospects of representing this country in Africa. You know when you graduate from class 1 to Class 3 the responsibility is more because it is no longer just TUK but National Champions. I want the players to celebrate as they truly deserved what they have worked for many years." concluded Mr. Ochieng. TUK will now represent Kenya at the African Championship slated for October in Tunis Tunisia.